...the home of ex libris bookplates and other rare and collectible booklabels. 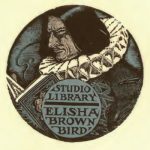 Bookplates and ex libris are rightly admired today as miniature works of art allowing collectors to build an affordable collection of original and often signed art works in a variety of print techniques such as etching, woodblock, intaglio and aquatint. 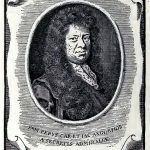 Other ex libris collectors look at book ownership rather than the artist who created the bookplate - for example, an ex libris from the personal books of Charlie Chaplin, Sir Arthur Conan Doyle or Charles Dickens. 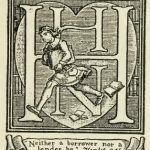 Whatever your own specialization, this website is a place to share our love of ex libris through images and historical articles. It has also been designed to help you track down items available online for your own collection, such as heraldic ex libris with personalized coats-of-arms, ex libris designed by artists and typographers, or bookplates of famous writers, collectors and even celebrities. Browse through the large assortment of antique, modern and contemporary ex-libris in the auction listings of ex libris bookplates for sale and if you can't find what you're looking for please use the search function in the menu bar...enjoy your visit!